Talk to aloof NPCs, solve puzzles, and dig through the private property of others without their permission in this evasive ZZT adventure. 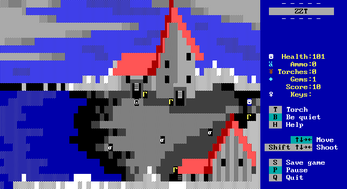 Now playable in-browser with the Zeta lightweight specialized emulator by Asiekierka. This game can also be played online at The Internet Archive here. Please note that save files might not persist between browser sessions. 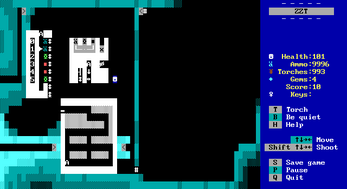 It can also be inspected and downloaded for offline play from the Museum of ZZT. Note that you'll need to grab a copy of ZZT (which is now freeware, and has always been available at no cost for playing 3rd party worlds) in order to run the ZZT file provided in the ZIP. Most likely, you will also require an emulator like DOSBox to run it on your modern computer. If you are unfamiliar with ZZT, it's a good idea to try out the original game world, Town of ZZT, to get a feel for how the base engine works. 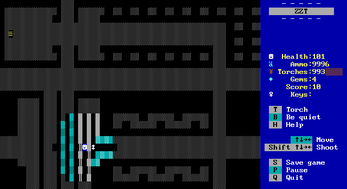 FAUXUNUS.ZZT - A collection of unused boards. FAUXAMIS.TXT - Information about the game.